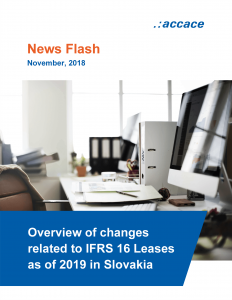 IFRS 16 replaces IAS 17Leases, for reporting periods beginning on or after 1 January 2019 and will end the practice of significant leased property assets being ‘off balance sheet’. Therefore, many companies are yet to adopt it. Find out with us the answers to the most frequently asked questions related to planned changes below. How is the lease defined by IFRS 16? IFRS 16 defines a lease on the basis of whether a customer controls the use of an identified asset for a period of time, which may be determined by a defined amount of use. If the customer controls the use of an identified asset for a period of time, then the contract contains a lease. In contrast, in a service contract, the supplier controls the use of any assets used to deliver the service. The major change is that under IFRS 16 there will no longer be any distinction between operating and finance leases in the financial statements of lessees. This means that entities will be required to include a right-of-use asset and an equivalent liability, at the present value of lease payments to their financial statements. Are there any recognition exemptions? IFRS 16 permits a lessee to elect not to apply the recognition requirements to short-term leases. Instead, a lessee can recognise the lease payments associated with short-term lease (maximum possible term of 12 months or less) is as an expense over the lease term, typically on a straight-line basis. IFRS 16 also permits a lessee to elect, on a lease-by-lease basis, not to apply the recognition requirements of IFRS 16 to leases for which the underlying asset is of low value (USD 5,000 or less). What would be the impact on the financial statements? The proposed lease changes will have a significant impact on many of the key financial statement ratio calculations used in assessing the performance or position of an entity. The gearing or leverage ratios will increase, as there will be additional liabilities brought into the debt element of the calculation. EBITDA (earnings before interest, tax, depreciation and amortisation) figures are likely to rise for companies applying IFRS 16 and the calculation return on capital employed will reduce. Which industries will be most impacted by IFRS 16? Retailers will be affected in an extensive amount, as the retail sector’s fixed asset base is largely leased, often on longer-term, non-cancellable leases. Will Your Company apply the new standard IFRS 16? Let’s implement the changes together. Contact us!